Frontera – Did You See That One? Roy (Harris), an ex-Sheriff, is seeking answers in the death of his wife (Madigan). While her death initially appears to be the result of an assault by an illegal immigrant (Peña), the truth might be far more complex. As he digs for answers, Roy begins to uncover a more disturbing truth behind her death. This drama was written by Louis Moulinet and Michael Berry, with Berry directing the film. For each of these men, this was their first major project. 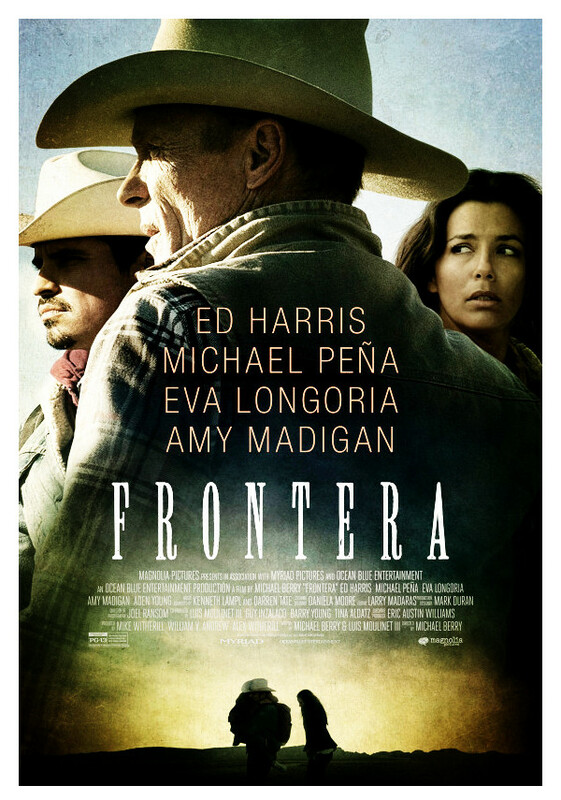 The film stars Ed Harris (The Hours), Michael Peña (Fury), Eva Longoria (Harsh Times), and Amy Madigan (Field of Dreams). This is an interesting story, written to accentuate the depth of the problems associated with illegal immigration. The story doesn’t push the politics, but it does seek to expose some of the perils the immigrants face. Luckily the story isn’t one to dwell entirely on these problems. Instead, the premise is a much smaller one that allows for a unique approach to the big picture. The combined story lines are well-written and interesting, but there’s little new ground covered. Unfortunately, the payoff for this film doesn’t make much of an impact. While the story might play well, it seems to resolve things too easily. I like this story, but I think it shows a lack of willingness to take risks when it matters. The acting in this movie is good, but nothing special. The best performance comes from Ed Harris. His role is weakened by some of the writing issues, but he still does a nice job. Michael Peña is also good in this one. Like Harris, he didn’t have a lot to work with, but does a nice job despite that. Longoria and Madigan do decent work with this one, but they don’t stand out much. A lot of the issues in the acting department probably began with the writing. This one just doesn’t seem to ask for much from the actors, so there weren’t many chances to do anything special. This movie doesn’t do much to make itself memorable. While the story might seem interesting on its face, it does little to follow through. The result is a weak attempt to make a statement about a hot-button political and social issue. While the film does dig up a little dirt, it seems to step back when it should push forward. I’m not sure that this is a great recommendation for anyone. Some fans of the stars might find this worth the time. Otherwise, this might be one to skip. I give this one 2 out of 5 stars. great review, I enjoyed it a bit more than you did, but I do see your points! Thanks for checking this review out. I’m glad you enjoyed this one. I just didn’t find much to be had in this one. That WAS a nice connection in the film. I think it just was too tame for the point it was trying to make. Pingback: The Rock | Did You See That One?